Our Cricut Maker quickly and accurately cuts hundreds of materials, from the most delicate paper and fabric to the tough stuff like matboard, leather, and balsa wood. Unleash your creative potential in our makerspace! 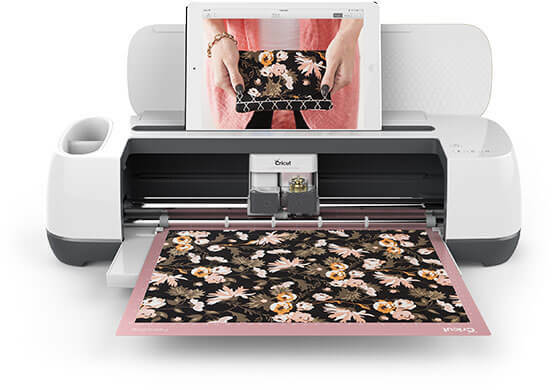 Unleash your creative potential by using our Cricut Maker - a cutting machine that handles fabrics, leather, paper, and balsa wood with effortless precision. It cuts sewing patterns in just a few clicks, and places more creative possibilities than ever at your fingertips. Our Cricut Maker can handle projects 1 foot wide by 2 feet tall. Reservations are available for up to 3 hours, on a first-come first-served basis. Get started by using Cricut Design Space to create your own project! Using your own material is free! We also have a wide variety of colours of adhesive vinyl available at a cost of $3.00 per foot. Large quantities of white and black permanent vinyl are also available. These are perfect for general purpose signage.